It's wonderful how God allows several of your passions to collide in unexpected ways. I've been a part of Interschool/Inter Varsity Christian Fellowship for many years serving in various capacities, but the arena in which I am most passionate about working is with youth camps. Oftentimes in a camp setting, we have to make something out of nothing, and work with limited resources. Nevertheless, year after year (with God's miraculous intervention) we manage to create wonderful events and experiences for the campers while working with a shoe-string budget, and a week or less of execution time. Fascinatingly, I have been able to utilize my architectural and design skills while working at camps in participating in spatial and design-oriented activities of all kinds. For the past few years I have been on the Banquet Night Committee. The Banquet Night is the last night activity for the campers, and usually involves a meal, a short programme (with a distribution of prizes) and some dancing. 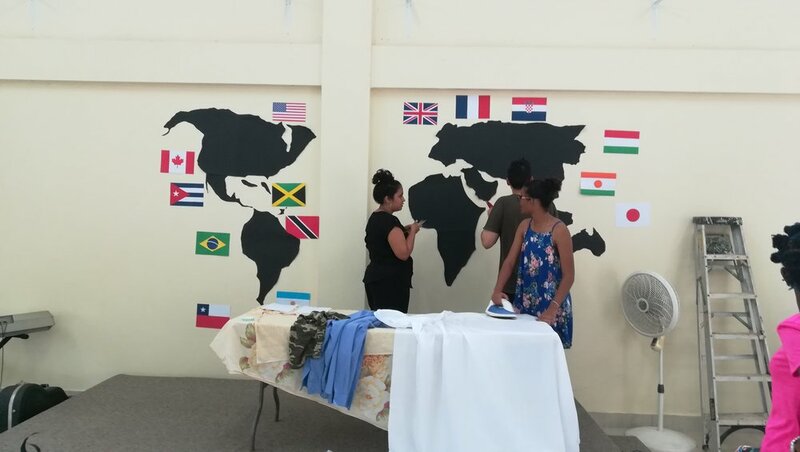 The challenge for the committee is to create a dinner setup (complete with a backdrop that suits the theme of the camp for that year) and to pull off the event with some donated supplies and a budget of five hundred (500) TT dollars, ie. approximately 75 USD. This year we set up the auditorium to host 40 campers and approximately 20 camp workers. The theme of the camp was "Cross Culture" and the theme of the Banquet was "Culture Shock". Below I explain the design direction, it's execution, and how the set up of the space facilitated fun activities for campers and workers alike on the day in question. The main concept behind the decor of "Culture Shock" was the notion of cultural fusion. We decided to focus on cultural influences from three major racial groups in Trinidad : African , Indian, Chinese. We threw these together in a mishmash for the centre pieces on the tables. For the backdrop, we envisioned a map of the world, surrounded by flags of various nations, with lights providing drama. We decided upon a loose colour scheme of red, green and gold and black. This came about because most of the flags we used for the backdrop had those colours in them. For centre pieces, we decided to spray paint the wine bottles partially in gold to use them as vases. 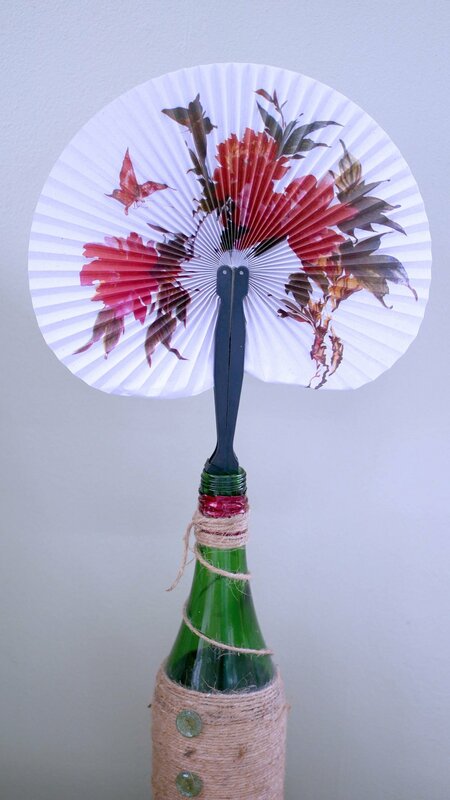 We then used the red and gold gift paper to make large Chinese style fans. We spray painted the back of the fans gold to make sure that they looked decorative from both sides. We also used the cheap Chinese fans that we bought alongside these handmade fans for extra oomph. 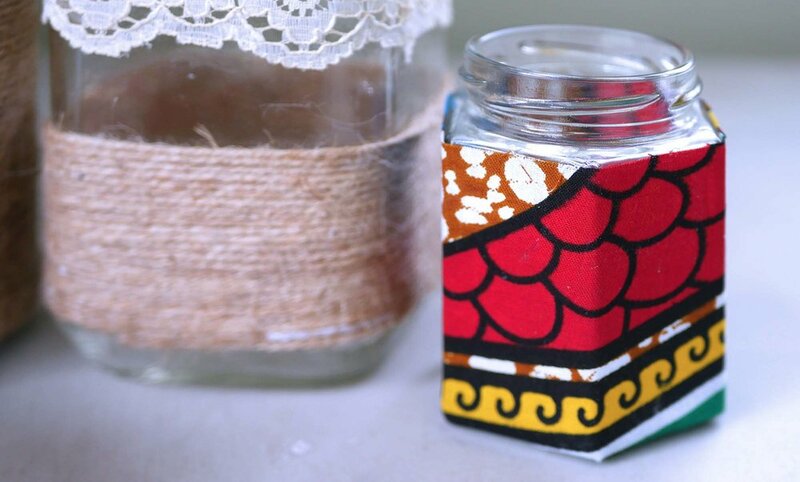 Additionally, for lower centre- pieces, we covered some jam and peanut butter jars with African print Fabric to make vases for some sprigs of greenery. The biggest impact, however, came from the backdrop: a map of the world surrounded by some country flags, and boosted with LED lights that were donated by our lovely DJ. To explain the vision to the team, I did up this image on Photoshop to describe the idea. We divided up the execution of it, and that worked out really well. Originally, the flags were supposed to be made with the white Bristol board, and painted, but gratefully, my creative in chief, Natalie, had a flag making party at home with some of her relatives and made some really awesome flags with coloured paper instead. We were able to keep the paints for future camp activities since we didn't use them. I then created the continents out of the black cardboard. I drew and cut them free hand and then double sided taped them to the walls. Many hands helped with putting up the flags. The plants were outside on site in pots, so we just relocated those. A ready and willing band of camp counselors were on hand to put everything together. The white Bristol board was used to create the title of the banquet, which we installed on the vertical centre column. 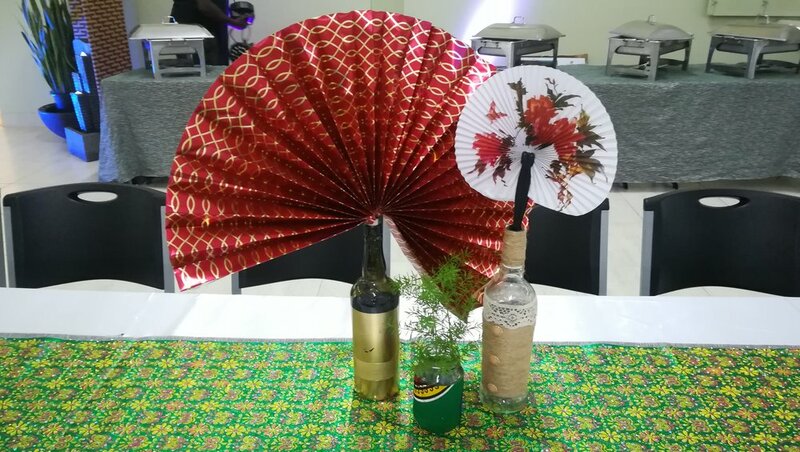 We grouped the Chinese fans, Indian table runner, and African print containers together for an eclectic blend. I think the thing that really brought this whole DIY design together was the lighting. It lent both drama and ambiance, and masked a multitude of sins. We stuck with the red and green colourscheme for the backdrop, allowing the red to create a notional cross as the light shot upward. The green lights shining toward the plants stage-side threw some tantalizing shadows onto the walls. We started making centrepieces at 10am, and the dinner started on time at 8pm. A good time was had by all, and I felt really accomplished after this DIY marathon. It was rewarding seeing everyone have the best of times in the space, and I managed to have enough energy to shake my bonbon with the other counselors and campers at the end of it all!